Grace Monroe has always felt like an outsider when mingling with her elite peers. Living in the time period of 1955 London, Grace is right on the verge of beginning a new and exciting life with her complacent husband. One day, Grace receives a mysterious letter that informs her she's received an inheritance from a woman she's never known or heard of. Compelled to learn more about her benefactor, Grace flies to Paris to find out and learn why she's been chosen as the mysterious woman's heir. Shortly after arriving in France, Grace begins to unravel the most decadent, yet seductive history about a certain perfume, and about the woman who originally inspired the creator to develop the scent. 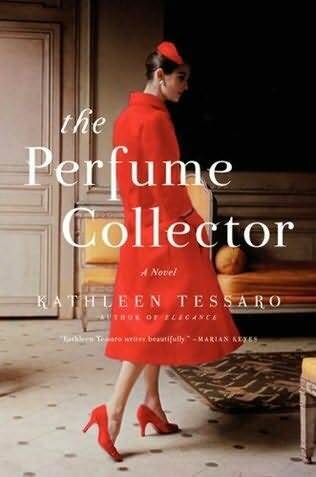 For romantic and unromantic souls alike, The Perfume Collector may be one of the most beautiful pieces of literature you'll ever read. Not only is the story mysterious and provocative, but it'll also renew your feelings in regards to love and romance and leave you feeling refreshed. Tessaro's novels are romantic without being obvious about it. Her characters are normal, everyday people that fall in love by accident, and not on purpose, without necessarily being ready for love to begin with. In hindsight, I wish I had made a more detailed series of notes about this novel. The entire experience of reading this book is nothing less than divine. With excellent prose and beautiful imagery, The Perfume Collector embraces the entire idea behind the muse, and the roles they play in artistic creations. "Most people assume that a muse is a creature of perfect beauty, poise and grace. Like the creatures from Greek mythology. They're wrong. In fact, there should be a marked absence of perfection in a muse - a gaping hole between what she is and what she might be. The ideal muse is a woman whose rough edges and contradictions drive you to fill in the blanks of her character. She is the irritant to your creativity. A remarkable possibility, waiting to be formed." Isn't that the most perfect definition of a muse you've ever read? Tessaro's conclusion in The Perfume Collector is inherently satisfying. You'll most likely sit around and think about life's possibilities after you finish reading this novel. Other novels by Kathleen Tessaro include Elegance, Innocence, The Flirt, and The Debutante. Click on any of the images of the books below to review them in more detail on Amazon.com. What's your personal definition of a muse? What are your favorite romance novels? Share your thoughts with us in the comments section below!